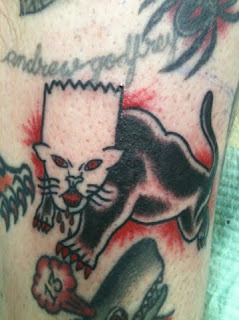 the drawings of Will Laren: Southside Bart-Cats tattoo! Wow! someone just sent me this picture of a tattoo they got of that Southside Bart-Cats silkscreen I did a while back! this looks awesome! technically this is the second person to get this tattoo but the first one was sent to me through tumblr so I couldn't post it here (plus the picture was pretty fuzzy) on top of this, he also donated to my Slurricane 3 kickstarter so he pretty much has the most dedicated fan competition locked up!